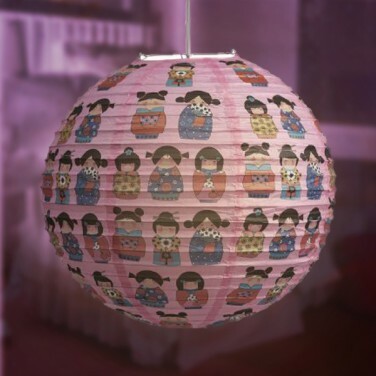 An unusual and quirky design that's perfect for little girls rooms, the Suki Japanese Paper Lantern is a large and simple lantern lightshade featuring cute and quirky Japanese Suki Dolls. Brighten up girls bedrooms with cute and quirky Suki Dolls on the charming Suki Japanese Paper Lantern. A traditional styled paper lantern lampshade with a large 40cm diameter, the concertina style makes a perfect sphere that casts a soft glow. The bright pink background and the cute Japanese dolls make a simply gorgeous decorative light that'll instantly lift your child's room.